Reviewed on: 6th March, 2011. Atmosphere: NightSky is a gentle, soft game in its atmosphere. There are no real threats or even a plot as such. 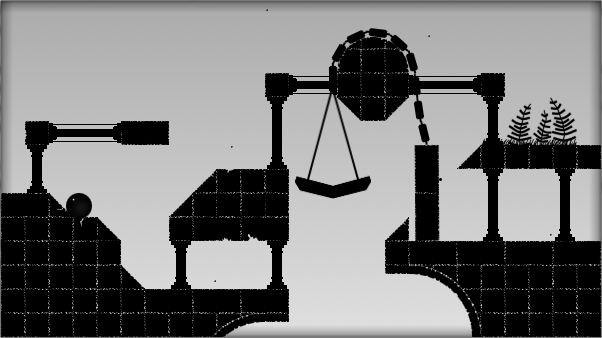 What is there is a collection of physics-based puzzles ranging from the very casual up to the very tricky. Control and Mechanics: The game has a few controls that require both hands and, as challenges get more complex, quite a dexterous manipulation of various keystrokes can be required to pull off some solutions to the more tricky puzzles. Who should buy this: Those who want a casual physics-style game where the challenge focuses on the dexterous rather than the cerebral. Those who want a game that pulls one in with more complex puzzles while remaining rooted in its casual aesthetic. Those who like a gentle slide into increasing difficulty. Who should avoid it: Those who want a more serious game. Those who want a game that has a lot more replay value. Those who want a game with more cerebral puzzles. Those who don’t want to pay for a game with a controversial sales practice (see below). Note that: Before the review, I wanted to bring up one problem I have with Nicalis’s pricing of the game. On their website, the game sells for a flat rate of 10 regardless of whether the units are pounds sterling, euros or dollars (whether American, Canadian or Australian). They have been informed of this several times, to my knowledge, but will not respond to anyone I’ve asked or correct the problem. Further, where the currency is significantly weaker than those (like the Danish krona), they have adjusted the price. This all strikes me as a low marketing practice. Steam have a more adequate pricing policy (despite similar problems in the past), but presumably they were not able to do the same there. Get this on Steam rather than their website or you will be paying more than you should be. The review below is despite this and the overall score I gave was not with this problem in mind. NightSky is a nice little addition to the array of indie puzzle and physics-based games available to modern gamers. It performs admirably well and is a very solid and enjoyable experience. This is all well and good except that such games in the indie movement are as plentiful as stars in the night sky and this is still behind Crayon Physics Deluxe or World of Goo. None the less, at a decent price, it does what it sets out to do but I cannot help but feel that there are a lot of other minor gems within indie gaming like Obulis that I would turn to first. The story starts with narration from a man explaining how he found a strange orb on a beach, glowing with some sort of life-force. He takes it home with him only to begin dreaming of strange places and events involving the travels of the orb. 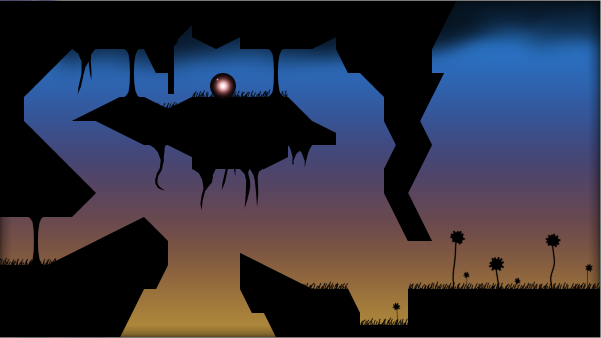 This is where the player takes over and guides the orb through a series of puzzles and traps of increasing complexity. There are three abilities that the orb can use to help surmount these obstacles. It can break or speed up (which is represented by an orange-red and blue glow from the orb respectively) and also, on a few levels, reverse the gravity (represented by a purple glow). These abilities are level-dependent and on some you can break or speed up and, on another, reversing gravity replaces speeding up and on a third, you get one or none of these abilities. Conversely, sometimes these abilities are locked on and you must complete the level under their effects. The game sports 11 levels that divide into smaller chapters which themselves divide again into a selection of screens. Getting stuck or falling off the screen normally requires you to go back to the beginning of the chapter, but sometimes there are save points within the game that mean you don’t have to go all the way back. It never tells you when this is happening, nor is there any special indication of the fact that you are rewarded for completing a chapter without having to restart except a star faintly outlined in the chapter menu of a level. This is something they could easily correct, but it’s not too much of an annoyance. The game offers a quite a few different styles and architectures throughout the levels, but I found many of the differences in style were somewhat obscured by the silhouetted nature of the foreground. The fact that almost everything is silhouetted does leave it confusing what you can go through and what will block you, but it’s something players pick up in a very short time. What is does offer is a nice contrast between the soft ambient colours of the background and the dark foreground. But the visuals are well-designed as are the puzzles and the game presents itself in a style that is very easy on the eye. The music adds to this relaxed, casual impression and it’s an easy game to pick up and put down after a few chapters. In normal mode, it’s very easy to fly through the few hundred screens offered in a few hours, but you’ll probably want to pick it up and put it down a few times if you’re of the casual mindset. If you are not, however, the game offers a more advanced “alternative” mode which changes the game in a variety of ways, making the game much more difficult. On this playthrough, most screens are changed in sometimes subtle ways and the normal solutions fail. Sometimes you cannot use an ability you used before or sometimes there’s an object that was not blocking you before. My overall problem with the puzzles is that they are never all that cerebral, despite what the game itself advertises. I never found a situation where I really had to think or experiment like in Crayon Physics Deluxe or Obulis to find the solution. Normally, after staring at the screen for a few seconds, I had the solution in mind. The challenge was more pulling off the combinations required to complete each screen than working out what I needed to do. Overall, it is not hard to recommend this as a solid piece of casual indie gaming, but it doesn’t really stand out midst the pack and I felt no need to return to it after I had finished. For a game with an interesting mechanic, lovely visual appeal and soundtrack, you won’t go wrong here but I would wait until a deal comes up unless it really appeals to you. NightSky is out now and available via digital distribution on Steam and through the developers. It costs £5.99 on Steam, I recommend avoiding the developers site due to their pricing practices.